Location: Approximately one quarter mile west of Great Malvern town centre. Description: A well house, with octagonal extension, containing a spout and basin. The traditional access to St Ann's Well is via the 99 steps alongside the Mount Pleasant Gateway to the Hills in the town centre. This forms part of the Route to the Hills project encouraging the movement of visitors to the hills from Malvern town and vice versa. The well is clearly signposted from the top of Church Street in the town centre and a brisk climb brings you to the Well House, built in 1813 with its octagonal extension built in the mid 19th century. Both are listed buildings, much prized by visitors and residents alike. "In a dimple of the hill...rises St Ann's Well, which is equally pure and salutary with the Holy-well, though less used. The ascent to it is by a zig-zag foot-path". Times have changed since this description of 1813. The narrow zig-zag footpath, which is still there, is used by those who can find it, but it became less well-used from 1830 when a new winding road was built by Edward Foley, the Lord of the Manor of Great Malvern, to make it easier for invalids to get to the well. The name 'St Ann's Well' first appears in print on a map of the Foley Estate made in 1744. At that time there was no well house; it was probably merely a pond on the hill side. The water received medical endorsement in 1757 when Dr John Wall published an analysis of it having found it to be of the same quality as that at the Holy Well. In the 1848 Geological Survey St Ann's Well is described as being at 820 ft and issuing at a temperature of 47 - 49 degrees F. The Ward Lock guide also identifies the height as 820 ft.
Naming the Spring - A misleading mythology has been created over time as follows. Like many ancient springs this one was once believed to have divine properties, and as some like to think was named after St Ann, mother of the Virgin Mary and patron saint of springs and wells. It has been suggested that the well was named after the chapel of the same name at Malvern Priory; and that the chapel was named after one of the altars in the old priory dating back to pre-Reformation times. The early monks dedicated the altar to St Ann because they identified her name with the water fountain on the hill. May suggests that the hill was once known as Tan Hill after the Belgic God of Fire and that St Ann was an early religious modification of the name. 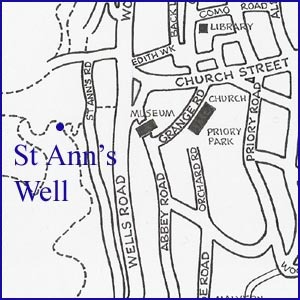 Denbigh notes that the well was named St Ann's during the mid 18th century. Variants of St Ann are extensively used when naming springs and some suggest that the name itself was a christian adaption of earlier religious beliefs. The patron saint of Brittany is St Anne and many springs in northern France are named after her. Here the suggested derivation is from Ana/Inanna, Universal Goddess of the Cosmic Waters and of childbirth. In Denmark mythology suggests an alternative origin. The mid summer solstice is a time when Holy Wells are believed to have miraculous powers. This is celebrated as St Hans Eve and the wells are known as St Hans Wells. People travel great distances to sleep by and drink the waters, hoping for a cure. Well markets are held and clay mugs are sold for drinking the waters. These are broken afterwards or left as an offering at the well. To be effective the mugs should not have previously been used and the water must be drunk in the open and uncovered. The linking of ancient wells with solstice worship suggests a link between the Celtic veneration of springs and pre Roman rituals involving solar alignments shown by Burle and others to be significant in iron age and earlier ceremonial sites. Whilst there is no evidence for these romantic notions about the provenance of St Ann at Malvern, St Ann's Well may nevertheless echo a long forgotten past. Following extensive research in 2005 and 2006, it is now believed that St Werstan, the martyr saint of Malvern Spring and Wells, founded his 11th century hermitage in the valley below the present day St Ann's Well building. This gave rise to the recognition of the valley spring as "Holy" and naming it St Werstan's Well. The background to this is given under St Werstan's Holy Well and this provides a much more credible explanation for the provenance of this source. The naming of the well as St Ann's occurred much later and the construction of a building for the well eventually took place at the head of the valley, above the original site of St Werstan's oratory. St Ann may be a contraction of St Werstan or possibly an error in deciphering the ancient stained glass founders windows of Malvern priory that occurred long after the Reformation, when the detail of the medieval history was lost. Early References to the Well - Smith cites one of the earliest recorded references to a spring or well at Malvern. In the 13th century there were disputes over the lands belonging to the priory. Bishop Giffard excommunicated two villagers in 1282. They were Stephen de la Wellputte (well pit) and Cecily atte Well. As this jurisdictional dispute was about lands at Malvern it is highly likely that these names referred to people residing in the vicinity of the valley spring St Werstan's (later Ann's) Well. The first recorded positive reference to St Ann however is much later. The 1912 copy by Osborne Thorpe of the 1744 Foley Estate Map names the well as St Anns. This is just two years after the Foley Family bought the Lordship of the manor of Great Malvern from Sir Thomas Bromley. St Ann's was also marked and named on the first edition Ordnance Survey map c.1840. 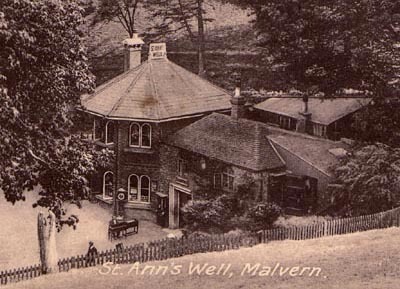 However the 1803 guide to Malvern does not mention St Ann's Well, possibly because at that time it was insignificant: the well house was not built for another dozen years. Benjamin Capper, in his 1808 Topographical Dictionary of the United Kingdom, describes Great Malvern as a parish of 163 houses and 819 inhabitants and says that the town had long been noted for its two medicinal springs, one of which was St Ann's and which was mistakenly described as bituminous. Access to the Water - By 1800 Great Malvern was becoming a popular tourist destination and in 1815 the well house was built and, nearby, some baths. Originally Lady Emily Foley owned the Well House, where the public had free access to the waters. During the early days of the water cure it was the most popular watering place for the wealthy invalids who flocked to Malvern but by the mid-1860s a different class of person was congregating at the Well. The town's traders were writing to the local paper about the drunken day-trippers coming in to Malvern by rail, and residents complained that the town was being ruined by the rude day-trippers. The Local Board then debated whether the public had a right to drink at St Anns Well under the 1866 Sanitary Act and the Nuisance Removal Act. The Board could not decide whether the well was a `public well', since the stones and mortar were private. Mr Archer, the Board's water expert, pointed out that the public had drunk there since time immemorial and should continue to do so. The Chairman, Sir Henry Lambert, was persuaded not to resign over this matter - a difficult one for him since he was nephew by marriage to Lady Foley. The public continued to have unhindered access to St Ann's and consequently the well suffered some 19th century vandalism: a visitor at the Foley Arms complained to the Board that he could not get a drink at St Ann's Well because there was no cup. The only comment came from the outspoken Chairman, Sir Henry Lambert, who curtly announced that the Board had better stick to its immediate business and not interfere with business beyond its province. Three years later a letter to the editor of the Malvern Advertiser asked: Sir, Can you inform me why it is that the people of Malvern are probably more mischievous and destructive than those of any similar place in England? If a drinking fountain is put up by any benevolent individual, no time is lost in wrenching off the cups and chipping the stonework.....I am sir, (happily) NOT A RESIDENT. The original spout and basin were removed in 1892 and installed in the grounds of the Mount Pleasant Hotel where they can still be seen. The spout and basin which replaced it, and which continues to dispense water, is of Sicilian marble designed and executed by Mr Forsyth of Malvern and Worcester. 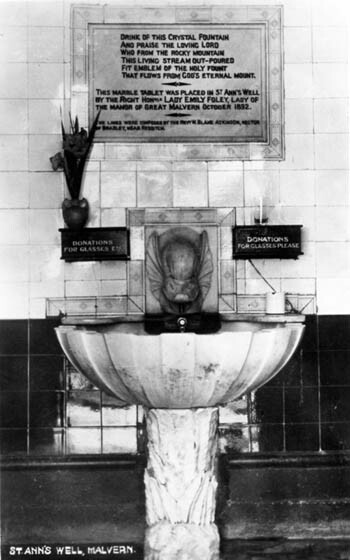 The dolphin head sits above a shell-shaped basin and the support displays carved hart's-tongue ferns. The whole was donated in 1892 by the Lady of the Manor, Lady Emily Foley. the Manor of Gt Malvern Oct 1892. The water at the spout is apparently from a cistern behind the dolphin's head. The cistern is filled from a pipe which runs under the cafeteria floor and the pipe is fed by the spring behind the building. This information came to light when the Conservators were obliged to investigate a leak. Today the purity of the water is rigidly maintained against contamination but this may not always have been so. In 1870 Sir Henry Lambert questioned the purity of the flow: "He...understood, whether the assertion was right he did not know - that the water had been interfered with at a point before it reached the well. He did not say it was so, but as the public had a right to use the water he thought the Board should make an inquiry in order to see that the water had not been diverted from its original channels". The flow here is notoriously intermittent, though not due solely to variable rainfall. During the drought of 1887 there was not a drop, but by the end of that year "extraordinary weather" i.e heavy rainfall, should have ensured a torrent. This was not so, as one visitor complained, having visited at the end of December and found: "to my dismay nothing was to be seen, or quaffed, but a few drops trickling forth slowly and grudgingly, as if after a summer drought. Further investigation revealed the fact that the spring had cut out for itself a new channel, and was running to waste, judging by the rushing noise it made, at the rate of any number of gallons a minute". This example is rare; usually during inclement and cold weather, when the spout was normally flowing, visitors stayed away! During hot summers visitors would flock here and "look forward to enjoying a drink of its matchless water," sometimes to be disappointed. St Ann's Well was dry for almost the whole of the summer of 1904 and in the following Spring it was recorded that "The water supply at St Ann's Well, like that from the other local sources, is still very limited. It trickles intermittently in small drops, and a thirsty wayfarer ascending or descending the hill who may be desirous of a draught of the `crystal spring' has to exercise a vast amount of patience before he can adequately supply his wants". During the following summer, another summer of drought, it was noted that it took 10 minutes to fill a tumbler. The summer of 1906 was also one of disappointment to visitors, one of whom complained more vociferously than the rest. "Sometime ago I referred to a mere trickling of the water at St Ann's Well and suggested that the application of the plumber's chisel might effect an improvement. Since the appearance of the note a plumber has evidently been at work. Passing the Well one day recently I observed that the water had ceased to run". By 1904 there must have been some water flowing because it was then that the proposal to the Urban District Council to build toilets was noted. They were subsequently built in 1909 on land given by Sir Henry Grey. Uses of the Water - In the early 19th century the Well was visited by invalids seeking fresh air and pure water and by local people out on the hills for the day; the young Princess Victoria visited the spring in 1830 as part of a tour which included Leamington and Bath. During the Victorian era it was the most popular gathering place for hydrotherapy patients and for walkers taking the "climatic cure". In the early part of the 19th century there were hot and cold bathing conveniences near the well and a female attendant looked after the well itself. She assisted those who came to bathe their afflicted parts and also distributed glasses of water to the thirsty. No charge was made, though donations were expected. It was noted in a medical work published in 1811 that, used externally, it was particularly beneficial for painful, deep ulcerations "the consequence of a scrofulous habit of body, and which are always attended with much local irritation and often general fever." It was also beneficial to sore eyes and for many years people with that affliction had been bathing here and at Holy Well. Dr Muspratt notes: "The water has for years been renowned as highly advantageous as an external application to indurated scrofulous tumours, ulcers, and many eruptive diseases, as well as efficacious, when taken internally, for acidity, dyspepsia, bronchocele, leucorrhoea, secondary syphilis, periostitis, articular rheumatism, dropsy etc." and also notes "ITS ENTIRE FREEDOM FROM ORGANIC MATTER". A 'particularly neat and clean' lady who lived over the well provided drinking glasses and helped invalids to put their affected limbs under a spout of water. Hot and cold baths were also available in a little bath house a stone's throw from the well house. All the facilities were free, though donations were anticipated. Once the new well house and baths were built Great Malvern out-rivalled Malvern Wells in its facilities for invalids. With its own holy well, baths, and far more extensive hotel accommodation, there was no need for anyone to bother going to the Wells. John Down Sen. and the Camera Obscura - John Down was born in Warminster, Wilts., at about the time the Well House was constructed - 1814. He was not a well-educated man - the opposite, if the truth be known - but he was talented, resourceful and assiduous. In the 1840s he made a reflector telescope "himself making every part of it from the casting of the speculum to the frame work on which the instrument worked." He fixed it to a cart, which acted as both base and transport and, having moved to the Midlands would, on fine nights, charge the youths of Birmingham to peer into the heavens. He learned to play the violin and played the great composers to his own interpretation. In 1851 he submitted some wax fruit and flowers to the Great Exhibition, taking first prize; his entry was the best in the world! He became very interested in photography in its early days and put his knowledge to good use after his arrival in Malvern in 1857. John Harcup mentions the Camera Obscura,  although its whereabouts is open to interpretation. Goodbury 1993 says the Camera Obscura was on top of the Worcestershire Beacon. Hurle & Harcup, Portrait of Malvern, 1985, says "John Downs later set up his studio on top of the Worcestershire Beacon, where the Camera Obscura revealed panoramic views." In Rock's "Views of Malvern" c1863, what appears to be a Camera Obscura is shown on St Ann's Delight, a short promontory ridge near the Well. A pencil sketch of Malvern dated 1857, in the possession of Roland Bannister, similarly shows what appears to be the Camera Obscura on St Ann's Delight. Early postcards of the Worcester Beacon Cafe show what is possibly a Camera Obscura turret on the cafe roof. It is our belief therefore that the Camera Obscura was initially set up in a small circular hut on St Ann's Delight but that the mechanism was later transferred to the Worcester Beacon cafe. 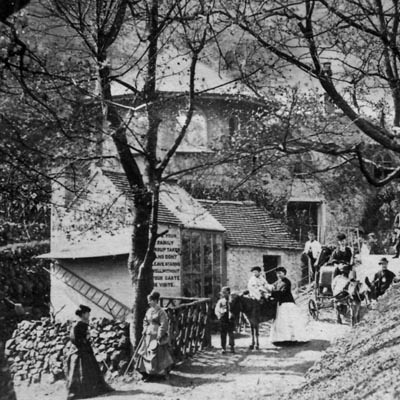 Circa 1877 Down retired from St Ann's Well and moved to West Malvern where he tried to build a large house. The challenge proved both embarrassing and harassing and placed a great strain on his health. He died 28 April 1887 aged 73 years, leaving a widow, grown up children plus two young children. He was buried at West Malvern - one of Malvern's real characters. St Ann's Well water has been bottled since the 1850s when W & J Burrow ran a thriving business from their factory on Belle Vue Terrace. Schweppes bottled their Malvern Water here for the Great Exhibition of 1851, switching to the Holy Well in the mid 1850s. In the early 1850s chemists Lea and Perrins' built shops and offices on Belle Vue Terrace for their soft drinks business. It was probably then that they agreed a lease with Lady Emily Foley, as owner of St Ann's Well, to run a pipe water from the the well to tanks at the back of their premises. Shortly afterwards the Burrow brothers took outright ownership of the property and continued to bottle St Ann's Well water. They had the responsibility of cleaning out and maintaining the pipe line without disrupting the flow to the spout; maintaining the building and the tea gardens, and providing tea, coffee and other refreshments to visitors. According to Richardson, Schweppes again bottled the water from St Ann's in 1930 and they were still bottling until the late 1950s. In April 1957 they installed a new pump but it was so noisy that visitors could hear it from some distance away so had to be replaced. A postcard c.1930 shows the bottling works to the rear of the pump room. Edward Green also apparently bottled the water c.1951. Many bottles survive from the days of Burrows bottling works including Codds, Hamiltons and syphons, of which the blue variety are particularly favoured by collectors. Analyses - The earliest analysis of the water was published in 1757 by Dr John Wall and Dr A Philips. Later, following further analysis, Dr Muspratt commented in 1913, "It has revealed the cause of its world-famed effects. The iodide of potassium, though present in very small quantities, nevertheless, when taken four or five times a day, besides being used externally for weeks, must exert its influence; the carbonate of soda, then, in cases of acidity and dyspepsia, acts its ameliorative part; while the carbonate of magnesia, chloride of magnesium, and sulphate of soda will have an aperient tendency. Further, and which recommends it in a very eminent degree, is its entire freedom from organic matter". There was very little danger of contamination since there were no dwellings higher up the hillside from which prejudicial sources could emanate. In 1895 the Well-keeper could assure visitors that the water made excellent tea because of the minute quantities of mineral matter held in solution. Demolish or Reconstruct? - In July 1963 the Malvern Hills Conservators decided by 10 votes to 8 to demolish this `lump of Victoriana' on the hillside. The buildings at St Ann's Well were to go, though the well itself would be preserved and housed in "a modest setting." Under the terms of the 1930 Act the Board was obliged to offer the building to the Council if they ever wanted to sell or exchange 'the part of the Hill known as St Ann's Well'. The Council had - it was considered wisely - turned down the offer, since 'the place had degenerated into something akin to a slum...' and the best that could be said of the well itself: 'At the moment it more closely resembles a public lavatory than an historic well-house and the tenant admitted...that it was in fact frequently used as such'. Three builders who were asked to give their opinion of the building gave a similar prognostication. One said that when Burrows owned the property years before, his firm was called out annually to repair and patch it up because of the damp. The second builder said it was impossible to prevent permanent damp rot; the third said it suffered from four D's - 'it was dank, dreary, depressing and dripping'. "I find Malvern people appreciate most things when they think they are going to lose them but they don't patronise them when they have them," perceived Mr W J Marsh, accurately. Among those concerned about the future of the old building was Sir John Betjeman, an authority on ancient buildings. His support and strong public feeling caused the Conservators to change their minds and in January 1964 the original vote was rescinded and up to 3,000 pounds was granted for repairs and restoration. Today St Ann's Well acts as a cafeteria and a dispensing point for the water. The decision by the House of Lords to prevent the Conservators reinstating the Beacon Cafe has placed greater emphasis on the building as a refreshment point for walkers - but access is only on foot, unlike Victorian times when donkeys carried the traveler to and from the source. The general area around the present building benefited in 2005 from a Heritage Lottery Fund grant that allowed re-landscaping of the pool. More recently there was an attempt by the Malvern Hills Conservators to oust the existing tenant, John Redman, who has run the cafeteria for 20 or more years, living on-site as a deterent to vandalism. The Conservators wanted a more sophisticated visitor centre as well as extended opening hours. There was also discussion on providing transport to and from the town to the well. This could possibly be a motorised "train". The whole debate led to a public outcry about the removal of John Redman and the Conservators spent in excess of one hundred thousand pounds in pursuing their plan, all to no avail. A change in leadership of the Conservators in 2012 endorsed John Redman's continued tenancy and an enquiry to ascertain whether the Conservators acted inappropriately verified that they did under the former chairmanship of Mr Ray Roberts..
1. St Ann's Well, an early paperweight, the baths are in the foreground. 2. The well in the 1930s. For approximately 50 years (c.1883-1934), Blind George Pullen played his Dulcitone at St Ann's Well for the many of visitors who came every year. 4. The present day fountain and basin. 5. 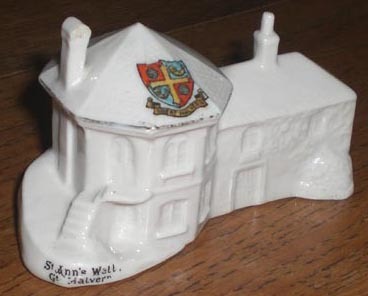 St Ann's Well early 20th century souvenir by Willow Art. 6. 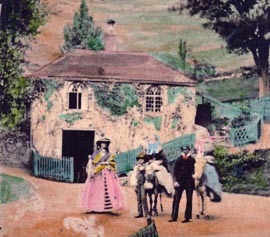 St Ann's Well, the photographic studio circa 1870. The baths building is next to the studio in front of the main building. (courtesy Chris and Roland Banister). 7. 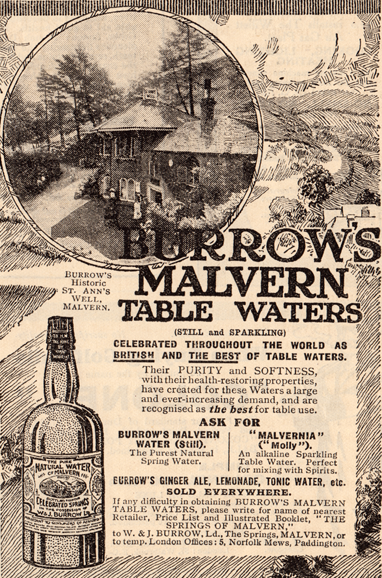 Advertisement for Malvern Water dated 1919. 8. 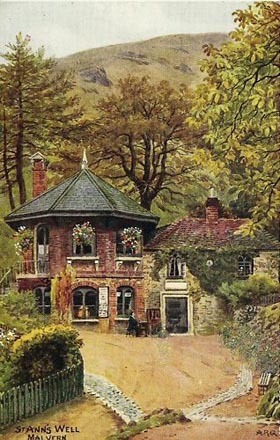 Early postcard showing the bottling shed at the rear. A Guide to all the Watering and Sea-Bathing Places for 1813 p.299. Malvern Advertiser, 13 Nov 1875. Weaver C Osborne B. 2006 The Illumination of St Werstan. Capper B 1808 Topographical Dictionary. Malvern Advertiser, 13/20th August 1864. Malvern Gazette, 26 Feb 1993, Well Springs New Leak. Malvern Advertiser, 5 Jan 1889. Malvern Gazette, 24 Mar 1905. Malvern Gazette, 15 July/12 Aug 1904/18 Aug 1905. Malvern Gazette, 9 Mar 1906. Minutes Malvern Urban District Couyncil 19 Noveember 1904. Weaver 1993, Osborne 1992 p.5/12 also Hinde 1988 p.204. ?????????????????? Malvern Guardian, January 1895 p.P14. Malvern Advertiser, 7 May 1887. Malvern Advertiser, 20 Aug 1887. WRO ref. 705:876 BA 8077/47 (x) Letters and papers relating to Schweppes Ltd.
 Malvern Gazette, 17 Jan 1913. Malvern Guardian, January 1895 p.14.